Today has been a dark very rainy cool day in New York City. Lunch for me today was very late. Starting the New Year super busy! Busy is wonderful! I’m not one to just slack off. Sometimes you just need a change of pace for lunch. This was one of those, “wonder how it would be if I add….” moments in the kitchen. This will be definitely a make again lunch and a favorite. If I can I will lay out the Swiss cheese and ham for a bit till they get closer to room temperature to aid the melting of the cheese. If not and the cheese isn’t runny enough I will often cover the pan till it’s gooey. Enjoy!! 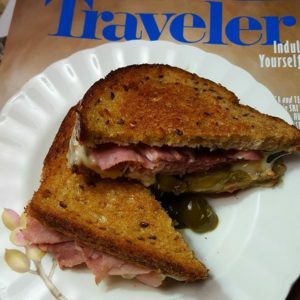 Zesty pickled jalapeños, oozy gooey Swiss cheese, and very thinly sliced ham! Other versions of this sandwich could be prepared and very tasty with thinly sliced turkey or chicken for sure! Warm the frying pan on medium heat. Add 1 buttered slice of bread butter side down in the pan. Top with 2 slices of Swiss cheese, layer the pickled jalapeños to cover cheese, top with the thinly sliced ham and cover with the other buttered on 1 side slice of bread, butter side up. Cook till the bottom slice of bread is browned to your preference. Then flip carefully to toast the other slice of bread. When the bread is toasted to your taste remove and eat.